Access all columns for free at Statistics for Biologists Nature Collection. The Points of Significance column was launched in September 2013 as an educational resource to authors and to provide practical suggestions about best practices in statistical analysis and reporting. This month we launch a new column "Points of Significance" devoted to statistics, a topic of profound importance for biological research, but one that often doesn’t receive the attention it deserves. The "aura of exactitude" that often surrounds statistics is one of the main notions that the Points of Significance column will attempt to dispel, while providing useful pointers on using and evaluating statistical measures. The column is co-authored with Naomi Altman (Pennsylvania State University). Paul Blainey (Broad) is a contributing co-author. In February 2015, Nature Methods announced that the entire Points of Significance collection will be free. When Nature Methods launched the Points of Significance column over a year ago we were hopeful that those biologists with a limited background in statistics, or who just needed a refresher, would find it accessible and useful for helping them improve the statistical rigor of their research. We have since received comments from researchers and educators in fields ranging from biology to meteorology who say they read the column regularly and use it in their courses. Hearing that the column has had a wider impact than we anticipated has been very encouraging and we hope the column continues for quite some time. 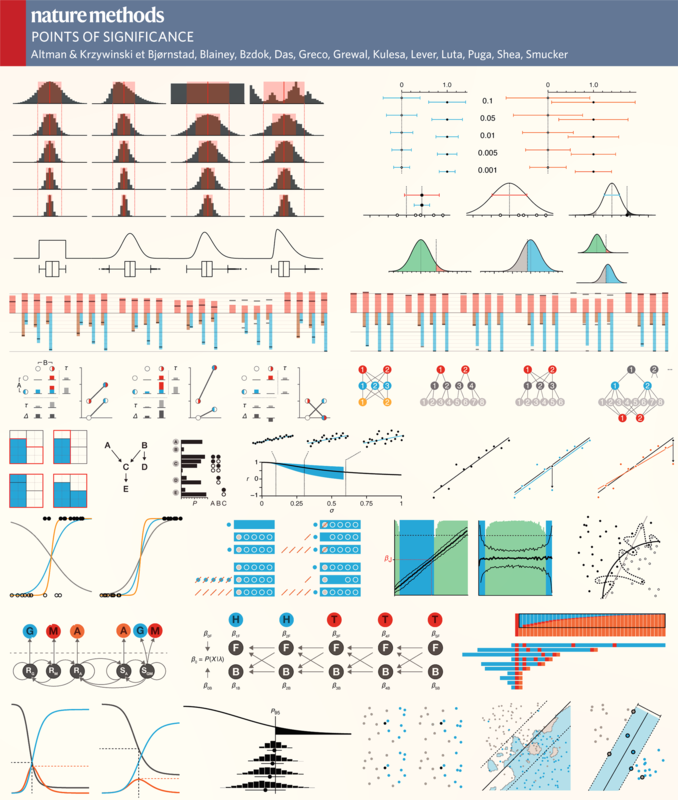 Also, in a recent post on the ofschemesandmemes blog, a new statistics collection for biologists was announced. The pieces range from comments, to advice on very specific experimental approaches, to the entire collection of the Points of Significance columns that address basic concepts in statistics in an experimental biology context. These columns, originally published in Nature Methods thanks to Martin Krzywinski and guest editor Naomi Altman, have already proven very popular with readers and teachers. Finally, the collection presents a web tool to create box plots among other resources. Each column is written with continuity and consistency in mind. Our goal is to never rely on concepts that we have not previously discussed. We do not assume previous statistical knowledge—only basic math. Concepts are illustrated using practical examples that embody the ideas without extraneous complicated details. All of the figures are designed with the same approach—as simple and self-contained as possible.